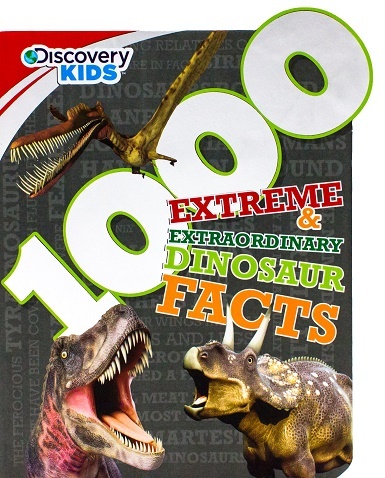 1000 Extreme & Extraordinary Dinosaur Facts is a new book from Discovery Kids. My mom and I received a copy of it as part of the Parragon Book Buddies Blogger Program. This book is a big book with 1000 facts about dinosaurs. But it's not just a boring list of facts! Each two page spread has a different category that consists of cool pictures and awesome facts. There are many pictures that can help you understand what the fact is saying. For example, a fact about plant eaters is written inside the drawing of a leaf and facts about certain kinds of dinosaurs are written inside their shadow shape. 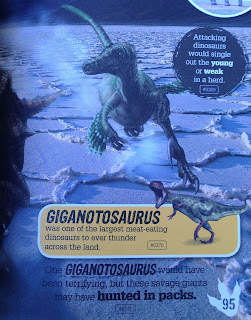 I think it's cool that the authors use things we know about today to show how long or how big the dinosaurs really were. The Argentinosaurus was longer than 3 buses lined up. That's really big! I really liked this book because, last year in science, I learned a little bit about dinosaurs and I wanted to learn more. I also like that the illustrations look real, not like cartoons. I like that you can start and stop wherever you want to when you are reading. You don't have to read it in order, you can look for the facts or the page that you most want to read. My favorite fact is that the ankylosaurus was one of the heavily armored dinosaurs that ambled along estuaries and coastlines 67 million years ago. That means they lived near beaches and they had really cool armored lumps on their back! Amazing! Bet we could all learn from this book, Ben!